The Saint-Gaudens design, lower center, graces modern American Eagle gold coins. 3. What Are the Dangers of Silver Investment? In billowing robes and windswept hair, Miss Liberty was rarely lovelier than on the $20 U.S. gold coin designed by Augustus Saint-Gaudens. Her torch might as well symbolize the passions of collectors, who bid a 1933 specimen up to $7.5 million at a Sotheby's auction in 2002. But investors seeking to diversify without the roller-coaster ride of the rare coin market might consider the U.S. Mint's modern American Eagle gold bullion coins, which unlike the originals are eligible for Individual Retirement Accounts. The price of gold, or "spot price," was more than $1,500 an ounce, as of early 2013. The metal is usually added to portfolios as a defensive investment to counter the U.S. stock market, which was setting its own records as the 2013 tax deadline approached. 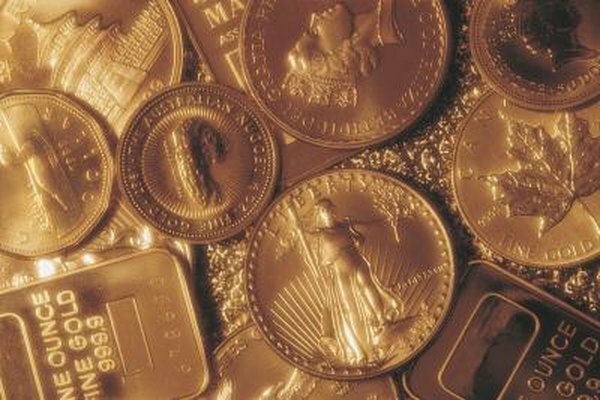 The U.S. Mint sells uncirculated gold American Eagles through unaffiliated dealers listed on its website. These coins, minted since 1986, are available in four sizes: 1 ounce, 1/2 ounce, 1/4 ounce and 1/10 ounce. The front resembles the original $20 Saint-Gaudens design of 1907-33. As of 2013, dealers were selling 1 oz. gold American Eagles for about 5 percent more than the value of their gold content. By comparison, the dealer premium for the most common dates of Saint-Gaudens coins in uncirculated condition was about 15 percent. The $20 denomination stamped on the coins is symbolic, since they are worth much more than their face value. Bullion American Eagles lack potential as collectibles, as suggested by the price difference, and their varying sizes also help make them more affordable. American Eagles can be tax-sheltered through a self-directed, precious metals IRA. The Internal Revenue Service prohibits using classic Saint-Gaudens coins in a retirement account. However, don’t expect to reach for your IRA Eagles at whim like King Midas. They must be stored in a secured depository by a custodian company, which will also set up your account on behalf of dealers who actually sell the bullion coins. Remember to factor the storage fees into your investment. The U.S. Mint sells proof versions of the American Eagle, which have a mirror-like finish, and special uncirculated ones with a satiny appearance. You can buy them directly from the mint or from a dealer, but these coins are a conundrum for investors. While their authenticity is unquestioned, they can cost hundreds of dollars more than their gold content. For that amount, you could buy a classic Saint-Gaudens with a common date or a worn example with an uncommon date. For investors insisting on the classics, the traditional drivers of coin values, other than the gold price, apply to the Saint-Gaudens. These include when and where the coin was minted, condition, design variations, and any production errors. Several third-party services grade coins for a fee and seal them in plastic cases. These "slabbed" coins are quoted, bought and sold like over-the-counter stocks once were.